Wow! 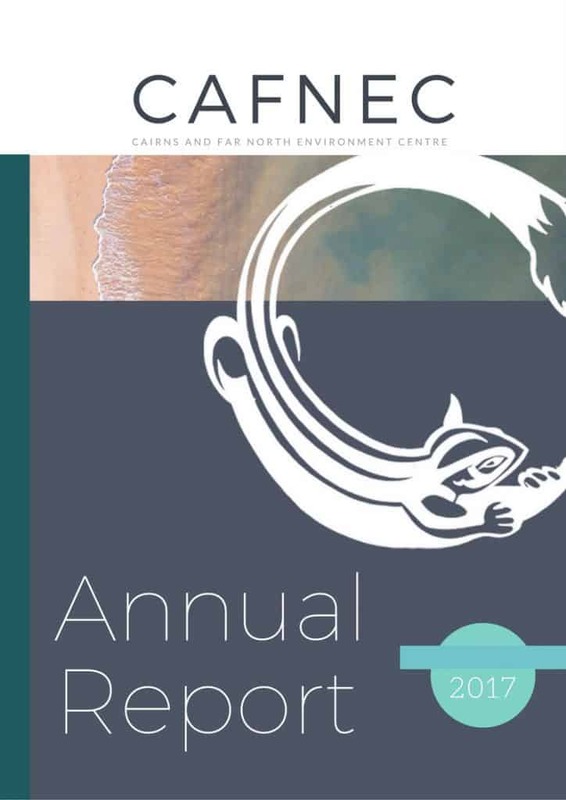 What a year and my are we proud as punch to present the CAFNEC 2016/17 annual report to you, our beloved members and supporters. It has been a high energy year both within the organisation and the conservation community. Gutted by a second consecutive coral bleaching, unseemly government support for the Adani mega-mine and a land clearing epidemic that is out of control, it would be easy to feel defeated and that action on climate change in Queensland is pie-in-the-sky dreaming. But things are only impossible until they are done. So let’s not get mad (or sad), let’s get organised! We are increasing regional cohesion. One thing is for sure we need good people acting in many different ways. Science, advocacy, policy and implementation are interdependent and we need each in equal measure. This year alone, we have collaborated with 30+ organisations and groups on projects, events and issues, brought together more than 40+ groups at our most successful EnvironmentFNQ Roundtable and we re-booted Green Drinks to promote informal relationships across the sector. As our regional cohesion grows so too will our ability to create better outcomes for the environment. We are building regional capacity. This year we collaborated with over 12 environmental organisations to deliver 11 different training opportunities to volunteers in Far North Queensland. This included a range of topics such as empowering women in the environment sector, community organising, digital skills, citizen science and engaging with decision-makers to name a few. Down south in the capital cities there are ample opportunities for volunteers and community advocates to learn new skills and new approaches to advocacy. We are actively working to bring more of these new approaches and research to FNQ. We are creating opportunities for the community to get involved. Stalls, festivals, film screenings, citizen science training, consultation workshops, community forums, sewing bees, online actions, community submissions, drain stencilling, school talks – you name it, we’ve done it this year! We work hard to ensure there are ample opportunities for the community to get involved in conservation. We also do our best to know what other groups are doing in the region to connect people with opportunities that suit their interests. We are strengthening the organisation. Having consistent and committed staff has made it possible for CAFNEC management to focus on the changes needed to strengthen the organisation. While the staff have been concentrating on identifying and implementing the internal systems needed to modernise and improve organisational performance, the management committee has been reviewing the constitution, membership structure and associated fees to ensure ongoing community support and a vibrant future for the organisation.